It is with great pleasure and pride that as Principal I can introduce you to Emmaus College. Since its inception in 1980, Emmaus has been well recognised for its excellence in Catholic co-education in the eastern suburbs of Melbourne. In our most recent school review it was stated that “Emmaus is a faith-filled, welcoming school community, the strongest evidence of which are the excellent daily relationships between students, staff and students, staff and parents, and the school and the wider community. Students appreciate the opportunities afforded them and the level of support they receive in wellbeing and the positive working relationships. There is a sound wellbeing program contributing to minimal bullying issues, respectful classroom behaviours and excellent student attendance”. We are very confident that our co-educational environment provides a more realistic way of preparing young people to take their places naturally in the wider community. With our school at full capacity at 1,330 students (we have a 50:50 ratio of girls to boys), there has been a definite trend of more and more parents choosing a Catholic co-educational secondary education for their children. We encourage all our students to strive to be their very best in all aspects of life, and believe our students are great ambassadors for their school. As a leading and progressive secondary college, Emmaus offers a broad technology rich curriculum delivered by quality and dedicated teachers. The school has many outstanding new facilities, with six significant buildings less than 14 years old and many other areas recently upgraded. In July 2017 we opened our striking contemporary new Galilee Centre that houses Languages, a 250 seat lecture theatre, VCAL, Education Support, Psychologists and Careers. We have commenced planning for a state-of-the art Creative Industries building (to house music and digital media), and hope that construction can commence before the end of 2019 (subject to approvals). 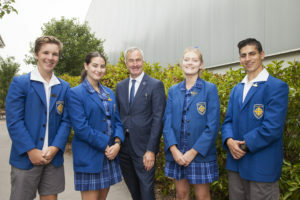 Our unique Y9@E program located at the Burwood campus offers Emmaus students wonderful opportunities for innovative and engaging learning while maintaining academic rigour during this pivotal year in secondary education. As well as our outstanding pastoral care program, our extensive co-curricular programs aim to meet the personal needs of students. We also provide many opportunities for students to develop their leadership potential from an early age, and be involved in social justice initiatives. I invite you to read the accompanying material on our website, and like so many other families in the eastern suburbs, to give serious consideration to choosing Emmaus College for your family’s secondary education.